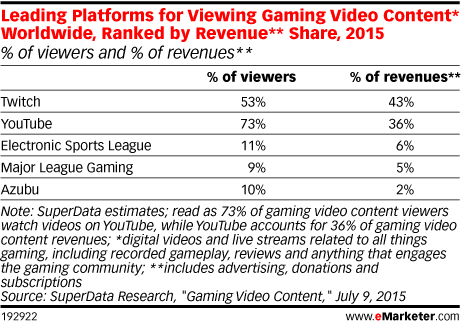 Data is from the July 2015 SuperData Research report titled "Gaming Video Content." 891 US internet users ages 18+ were surveyed online during April-May 2015. Respondents identified that they viewed gaming video content at least once this year. Sales data from developers, publishers and payment service providers in 50 countries was analyzed. Data included average selling price, genre-specific information, payment method and value. Data from 37 million unique paying online gamers was also collected, including installs, logins and user acquisition cost.